The market leading iDrive® LED driver range now includes the 300W iDrive® Thor 16. 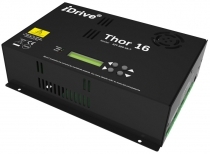 The iDrive® Thor 16 is a multi-output LED driver specifically designed for 12V or 24V constant voltage LED systems. Each output is capable of providing up to 8A with a maximum of 13A (24V) or 26A (12V) across all 16 channels. Advanced control technology combined with the powerful ieOS operating system enables users to dim the constant voltage fixtures in 8-bit or 16-bit mode, giving unprecedented accuracy for dimming & colour control. The system has been designed to operate using DMX, RDM, DALI, Art-Net 3, sACN, Art-Osc & TCP/IP protocols and the LED output channels can operate in common anode mode. Special features include over voltage, under voltage, short circuit and power optimisation functions. The Thor 16 is ideally suited to TV and film applications due to its high frequency, high resolution outputs, which can be dynamically programmed up to 65kHz. The Thor 16 also provides an advanced routing and protocol conversion engine to convert between DMX, RDM, DALI and Ethernet protocols, such as Art-Net, Art-Osc and sACN, ensuring that you can deliver any project. The iDrive® Force 24 is an advanced DMX/RDM 24-channel LED driver, with variable forward current, dynamic power sharing and the ability to operate in constant current and constant voltage modes. The Force 24™ delivers a 672W output in a compact 19”, 1U package and is complete with 24 DMX start addresses and observe menus. It is ideal for architectural and entertainment applications. The advantage of the rack-mounted system is that it facilitates initial installation and programming, thereby reducing installation times, as well as maintenance and software upgrades as they become available.